Our trip to Japan this week was meant to be roughly split into three parts: retail (for a shopping guide), bespoke makers (for a range of posts and freelance articles) and Japanese crafts (around Osaka and Kyoto). But strangely enough, it was the bespoke elements of the retail stores that impressed us the most. Stores like Isetan, United Arrows and Beams (with all their various branches) are impressive in their way. There is a greater range of high-end shoe brands, for example, than you'd find pretty much anywhere else - and Italian tailoring/shirtmaking labels. But in the end, it's all product you could find elsewhere, and much of it is dominated by the big fashion brands. On the other hand, when we reached the 4th floor of Isetan and ran into Lorenzo Cifonelli in the midst of cloth bolts in the 'bespoke corner', it was genuinely surprising. 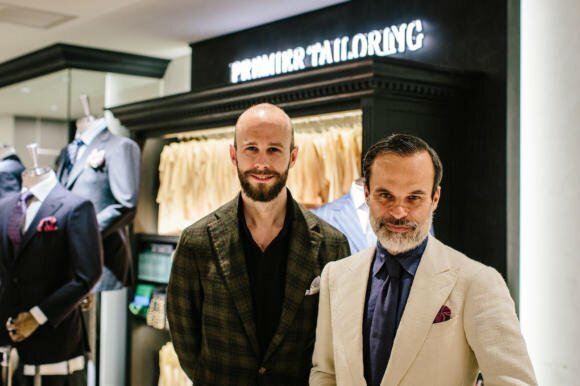 Lovely to see Lorenzo, of course, with his glorious white-bearded grin; but more interesting to see the cloth, the paper patterns, the sales staff earnestly explaining the Cifonelli style (with the aid of my The Finest Menswear in the World). Lorenzo comes twice a year (less than a lot of other places) but nowhere else is he in a store like this. Upstairs, we ran into Timothy Everest, in the middle of fitting a trench coat on a Japanese customer. I had known Tim was going to be there, and we had planned to meet for dinner. But again, striking to hear that around 60% of his business in Japan is made-to-measure, driven by events like this. Apparently this is a particularly busy time for trunk shows - known as 'silver week' - but artisans come all year round. 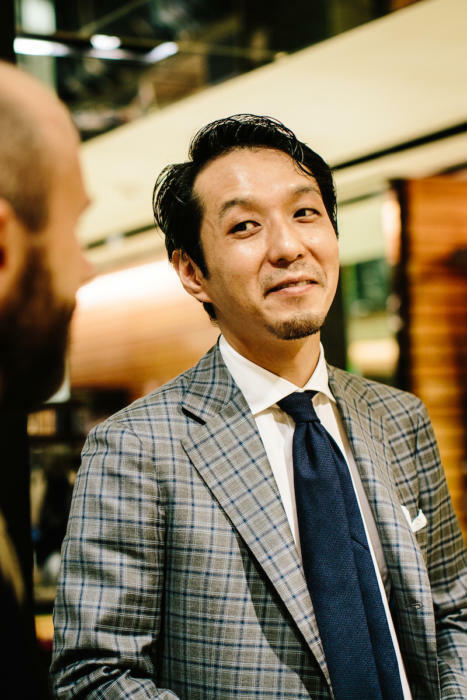 Strasburgo has often been at the forefront of pushing bespoke in Japan, increasing its activity recently. The next day we met two of Strasburgo's in-house artisans: shirtmaker Masanori Yamagami (above) and tailor Noriyuki Higashi (below, also known as Sartoria Domenica). They have a home on the top floor of another Strasburgo branch, in what's called the Tailor's Lab. (Trouser maker Igarashi used to be there too, but is now on his own). The Lab, launched two years ago, is a big space with fittings around the walls, cutting tables and alterations tailors in the back (shown in top image). Downstairs are men's and women's retail levels - though even there, there was both an Italian shirtmaker and shoemaker Yuki Shirahama in the middle of shows (bottom). This support of bespoke by big retailers is one reason the trip made us think the future of bespoke is in Japan. It's always hard for artisans to educate the broader public without it. But arguably a bigger factor is the volume of young Japanese tailors and shoemakers setting up shop. 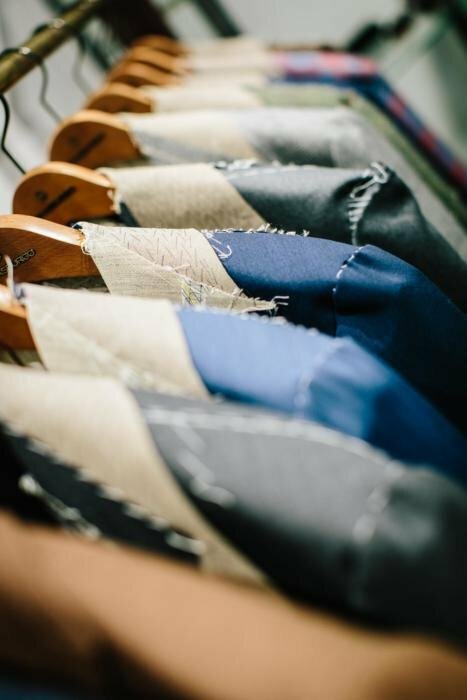 After all, there have been fashions for bespoke before: ten years ago the likes of Panico and Campagna used to visit Japan, but largely stopped around 2008 after the financial crisis. 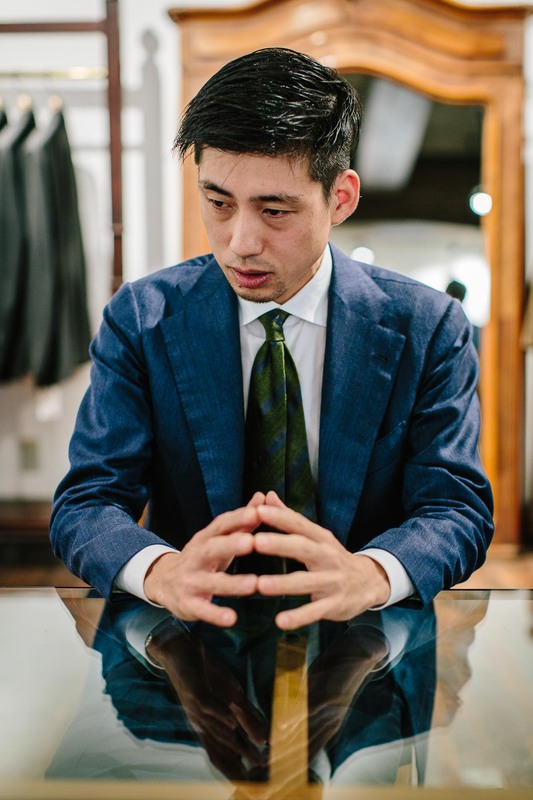 The future of Japanese bespoke lies with young makers like Shirahama, Yamagami, Higashi and the dozens of others around the country. We'll cover many of them over the coming weeks. This trip could not have happened without the extensive help of Masaichi Hasegawa of Gaziano and Girling while we were in Tokyo, and Jason Yen of Gaziano and Girling/Camps de Luca in advance. Thank you both. You can follow the discussion on Japanese retail and the growth of bespoke by entering your email address in the box below. You will then receive an email every time a new comment is added. These will also contain a link to a page where you can stop the alerts, and remove all of your related data from the site. It stands to reason that Japan would run away with the bespoke renaissance, in hindsight. They are a wealthy, aging nation. More importantly, my impression is that they have a respect of craft that borders on the religious. Quite aside from nice clothes, your piece reminded me how badly I want to go back to visit Japan. I live just up the road from Isetan in Tokyo so your trip is of great interest to me. Isetan is a superb shop, and to call it the Selfridges of Japan, as many do, does it no justice at all. Naturally, the service is excellent, I once bought a pair of jeans from the Brioni concession there, and had them adjusted before picking them up. Due to a slight error I was overcharged the equivalent of about a pound on my initial payment. When I came to collect them this was reported to me by an ashen faced assistant who seemed on the verge of tears. I was ushered towards a leather armchair and was brought my refund, and a cup of tea, and then received about another 6 apologies, and deep, deep bows by everyone who worked in that area of the store. Charming. That said, I almost never buy clothes in Japan now. Taking the exchange rate with the UK into account – strong Yen, weak pound – it makes no sense at all, at least in my case. What a fascinating trip Simon. We often hear about European tailors and makers selling in Japan either through individual stores, concessions or by trips (a la Cifonelli, above), but do you know if any of the Japanese tailors and other craftsmen plan (or already undertake) visits here to the UK? Isetan is a temple, but all the momentum is in Ginza, Marunouchi and Omotesando. 90% of what you find in Isetan, you can find in other shops. Their sales are great though. 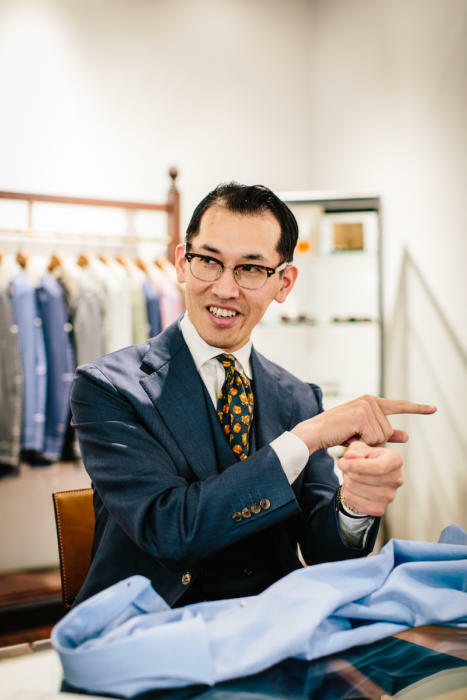 Higashi-san is bringin his A game…that said, the only guys in Tokyo who dress like these gents are TV personalities, grandpas with too much disposable income and the staff at Strasburgo. Eventually, the opportunity arises to ask you whether Japanese women are as interested as their their guys conterparts in tailoring. Whether an amazing tailor such as Kathryn Sargent is for instance also known to them. I mean aside aside the guys who are in the know. Simon, thanks for the guides to the stores above. To Simon and the community here – I’m going to be making a trip to Japan (Tokyo and Kyoto for sure) for the first time this year and am hoping to get store and shopping advice. Looking for recommendations on anything worth checking out – menswear, leather-works, crafts, artwork, jewellery (for the wife), and cool Japanese specific cultural items. Any tips on where and what to check out, would be super appreciated. Thanks so much. Do you (or anyone else) know where Igarashi is now, or how to get in contact with him? Wonderful! I was hoping to be able to arrange to see him when going to Tokyo in two weeks time, so any information before that would be very much appreciated (he seems to prefer making trousers over updating his web site, which is as it should be). Thanks! We visited his workshop in the centre of town, which seems to be doing very well. So it shouldn’t be a problem to arrange to see him while you’re there. Which stores are the must visit for menswear in Tokyo if I’m not looking to tailor any stuff ? Thank you! Do you know whether the newly enacted Japan-EU free trade zone will make Japanese goods more accessible/ affordable in the UK? Can we expect to see a reduction in the price of Japanese imports from companies that stock them (Kafka, Trunk, Real McCoys…) or more brands/ artisans selling their goods or visiting the UK? Good question Hugh – no idea though I’m afraid! One thing I do know is that tariffs are only one of the things that make such pieces expensive, or harder to import, so there’s no guarantee there. And often stockists try not to change with every change in tariff or trade – eg Aldens have become much more expensive to import because of Trump’s tariffs, but stockists will try and keep the price increase to as little as possible.